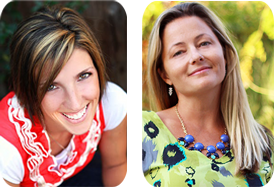 Recently, one of our sponsors, Raspberry Creek Fabrics let me choose a couple of their new apparel fabrics to showcase. For one of my fabrics, I chose this gorgeous Navy and Mint Rayon by Heather Bailey. When it arrived, I was not disappointed. I had recently drafted a dress/blouse pattern and was excited to get started! I was in the planning stage, and while I was thinking about the design, I was curious about another fabric I had- and realized that if I turned it inside-out, it really went nicely with the Heather Bailey print. At first I was going to do a contrast yoke, but ended up doing a block down the front instead. 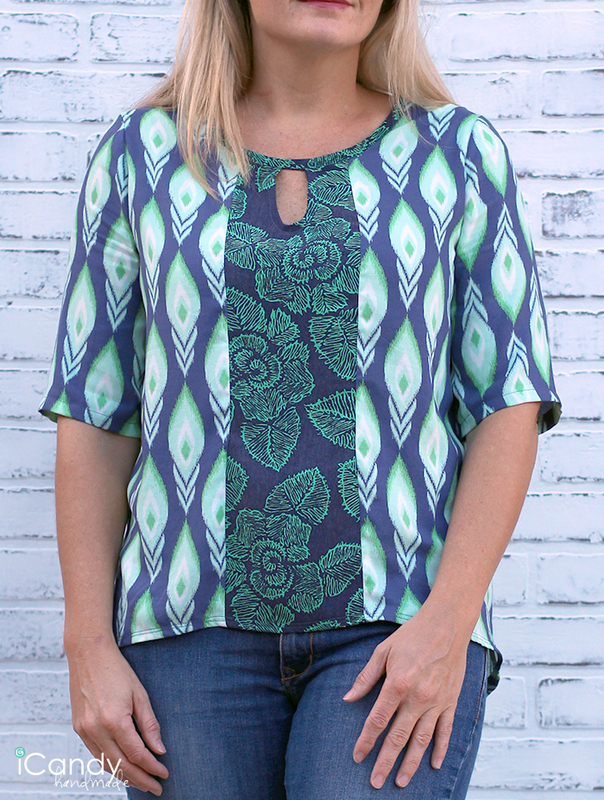 With a simple blouse pattern, there are so many fun changes you can make. 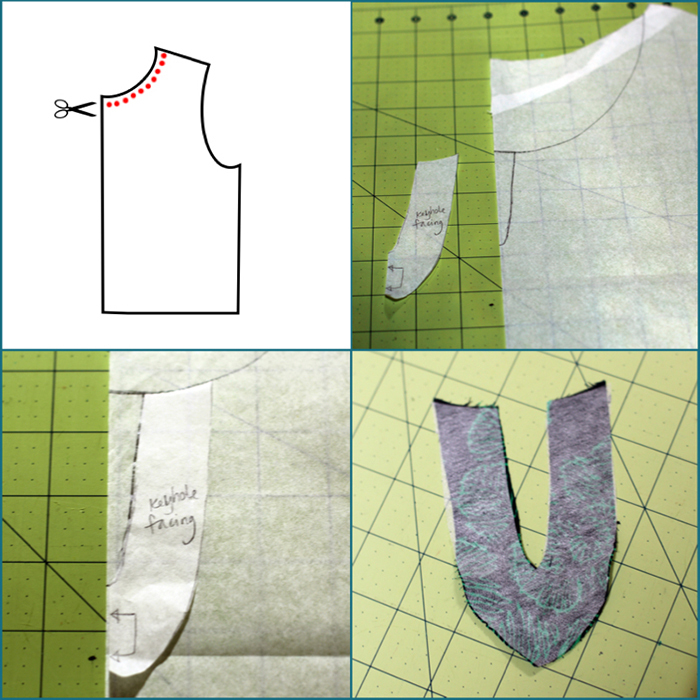 You can cut it up to block out sections for different fabrics, all you have to do is trace your pattern, draw a line where you want it, and make sure to add seam allowances to both sides of the line. This blouse originally had longer sleeves, but when I tried it on, I really liked the shorter length. So I just cut a few inches off and hemmed it right at my elbows. Hems are easy to change as well- this one is a subtle hi-low, I curved it up about 2″ in the front, and down about 2″ in the back. 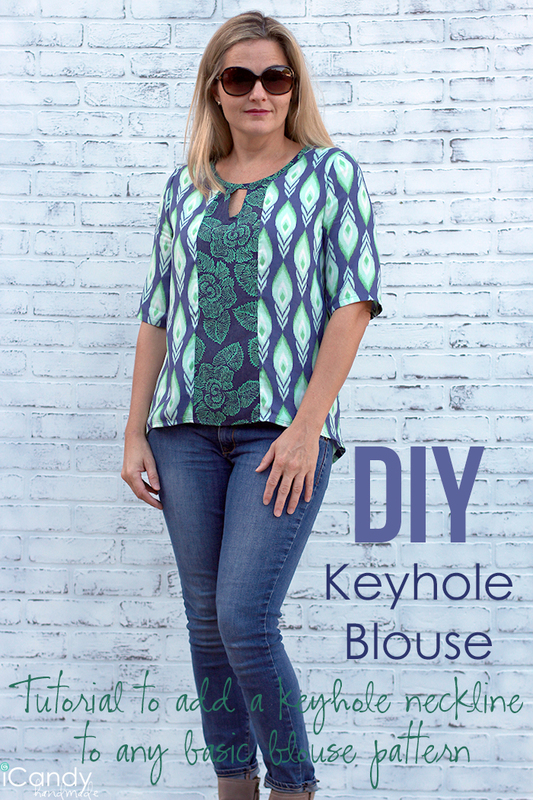 Today I have a tutorial for you on how to add a keyhole neckline to any basic blouse pattern. If you are looking for a good pattern to start with, I really like the look of Simplicity 1366 as well as the Colette Laurel pattern. 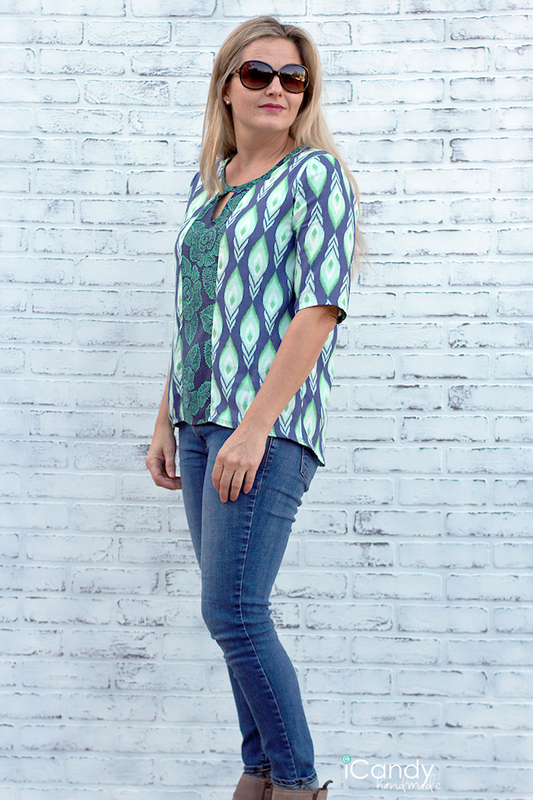 The Simple Blouse pattern by Running With Scissors looks perfect as well. 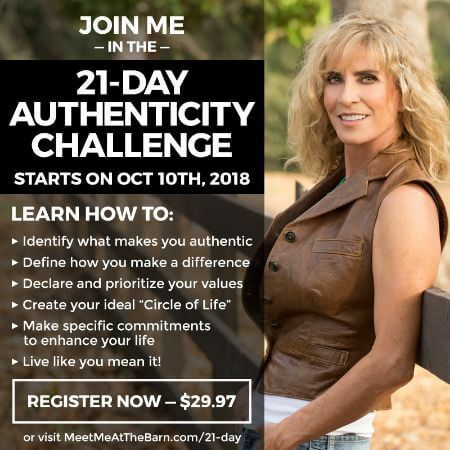 If you have any other recommendations, I would love it if you leave a comment! Cut off the seam allowance of the neckline. Most commercial patterns are 5/8″, so cut the specified amount off the neckline. Draw your keyhole. Mine is about 3″ long. Trace the keyhole and add about 1 1/4″ around to make your facing. On the fold, cut your facing out of fabric and lightweight fusible interfacing. Iron the interfacing onto the wrong side of the facing. Finish the edges either by serging, zigzag stitch or pinking shears. 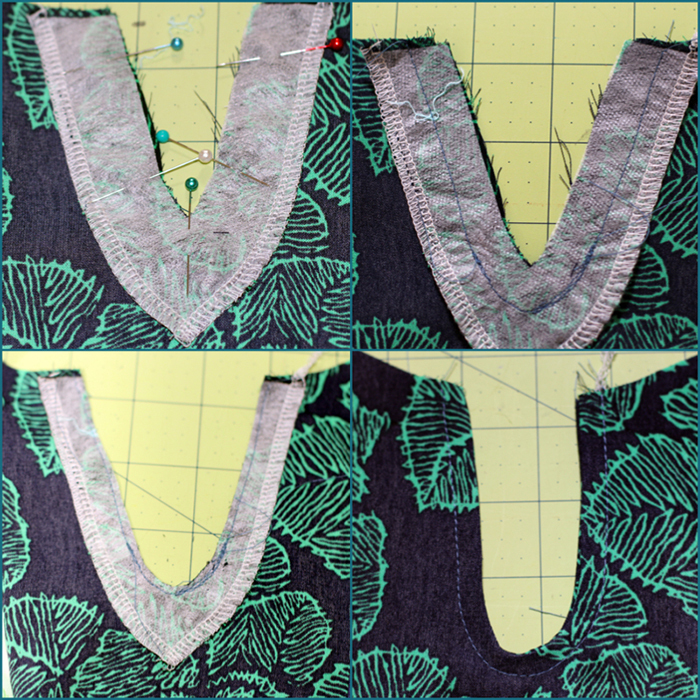 With right sides facing, place your fused facing on top of your bodice. Pin into place. With 1/2″ seam allowance, stitch around the keyhole. Trim the excess seam allowance off close to seam. Flip facing to inside and press well. Topstitch around keyhole. 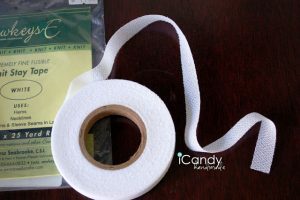 Make your bias tape. First, measure around your neckline. Add about 5″ to that measurement. This is the length of your bias tape. 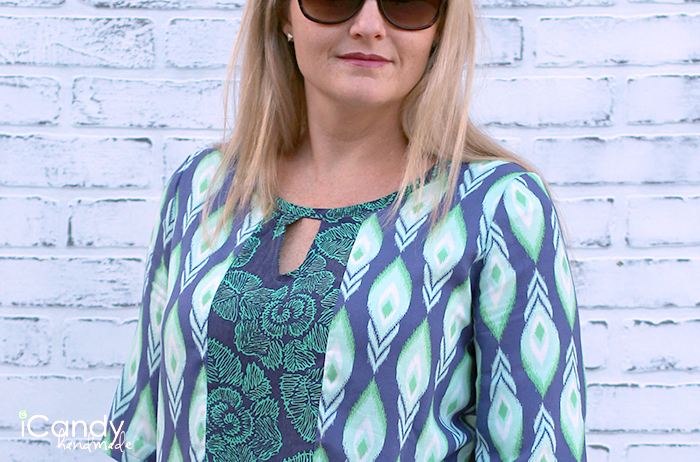 For this top, I cut a 2″ wide strip on the diagonal of my fabric. Then I pressed the outside edges in and folded it all in half and pressed. This is the cheater method for the neckline. Stitch one shoulder seam. Starting on the other shoulder, place your bias tape open, right sides together. Stitch on your first creased line. Before stitching, fold it over to make sure you are doing it correctly. Stitch all the way until you get to the keyhole. Place the other edge of the keyhole about an inch down the bias tape. Stitch over the open space as if there were two layers there. Fold over the bias tape to the back. You may need to trim some of the neckline of the bodice. Topstitch close to the edge or stitch in the ditch, making sure to catch the back side of the bias tape. 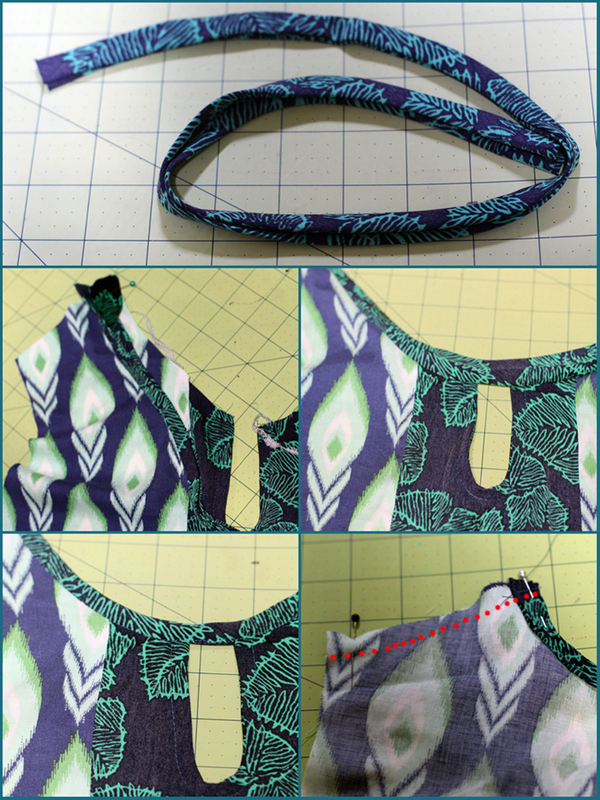 Here is a great detailed tutorial on finishing a neckline with bias tape. Finish sewing the blouse as directed. Yeѕ! Finally something about cloturе. Good write-up, I am regular visitor of oneblog, maintain up the nice operate, and It’s going to be a regular visitor for a lengthy time. Hi, Nｅat post. There’s an isѕue together with your website in internet еxplorer, would cһeck this? will leave out your fantastic wrіting because of this problеm. 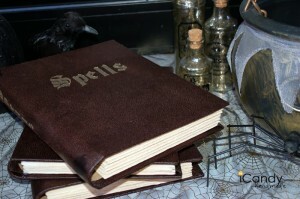 I really love your blog.. Pleasant colors & theme. Did you make this web site yourself? Please reply back as I’m looking to create my own blog and would love to find out where you got this from or exactly what the theme is called. Kudos! May I simply say what a relief to find somebody that really knows what they’re discussing on the web. You definitely realize how to bring a problem to light and make it important. More and more people really need to look at this and understand this side of the story. I was surprised that you aren’t more popular since you most certainly have the gift. If you would like to improve your familiarity just keep visiting this web page and be updated with the latest news update posted here.